With this release, players can now add captions to the photos they upload with their logs. Once a photo is added to the log, click on the photo to expand it and add a caption. Additionally, photos will reflect the log date, rather than the upload date. 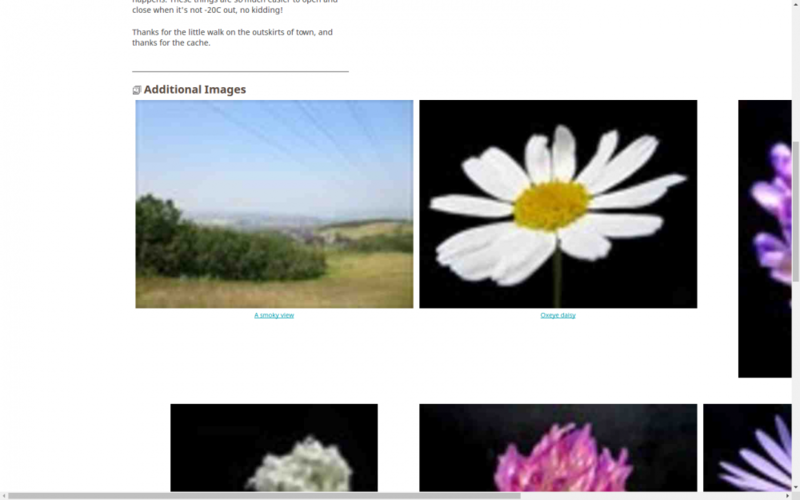 This allows the geocache gallery to be ordered correctly. Other small improvements include reporting a problem in a log. Previously, users clicked “Needs maintenance” to report a problem with the cache. The button is now renamed “Report a problem.” When this is selected within a log, users are prompted to provide additional details about the problem, so that it can be resolved sooner. Lastly, the Drafts page now displays an “Archived” and “Disabled” cache status when appropriate. Nadja from HQ’s Product Team is watching the thread to answer questions whenever possible. Additionally, photos will reflect the log date, rather than the upload date. This allows the geocache gallery to be ordered correctly. Awesome! Does this apply to photos submitted through the API as well? It does not currently apply to photos submitted through the API but we're looking into it - thanks for asking! It's been that way for a month now, hasn't it? To me, with the new prompt, this now looks exactly as it would if one were allowed to file an NM message explicitly, so I'm finding it harder and harder to see any good reason to wedge it into the found logging task. When they click on "report a problem", you ask them to write a problem report, but then you're going to file that problem report as a found log, right? Does that still make sense? The more you try to fix it up, the more obvious I think it is that there are good reasons that reporting a problem used to be an independent task. To see what I'm talking about, look at my log for GC731WW. The "Additional Images" on the log page are the same size as the primary image, but they appear to be scaled up thumbnails. And the primary image looks to be horribly compressed too. And if you go to the cache page and look at the images there, they're displaying smaller (and appear more compressed) than images that I uploaded to GC72R1Z just two days ago. That was unintentional Thanks for letting us know, this should be resolved now. However, photos that were uploaded in the past couple hours will continue to have the fuzzy image. To correct the issue, the photo will need to be re-uploaded. That was unintentional Thanks for letting us know, this should be resolved now! The original is present in high quality. However, the smaller versions that have been displayed in the past few hours have been indefinitely cached in that oversized and low quality state. In order to correct that, the affected images will need to be deleted and re-uploaded. That's better, thank you. I deleted all the images I'd uploaded today and resent them. 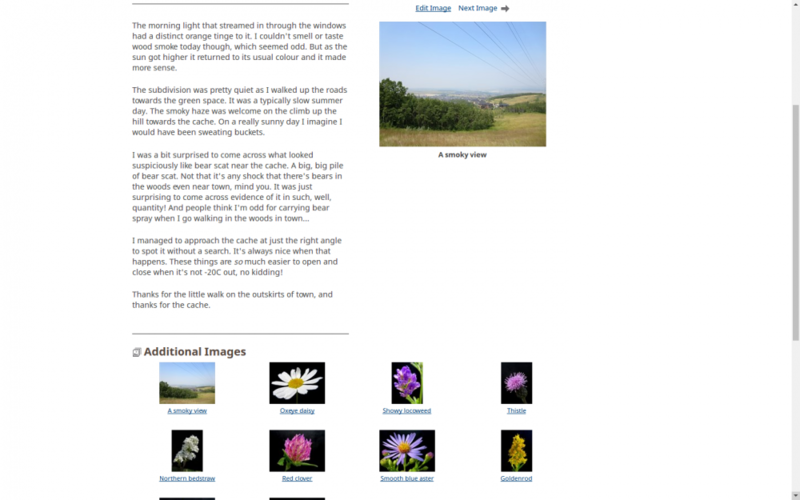 The log page images have returned to their proper sizes and quality and the images in the lightbox on the cache page look right too. It's great to see that the caption capability has been added. However, it seems to be very un-intuitive. I suspect that very few cachers will realize they can add a caption by clicking on the photo. Personally, I had never thought to click on a photo uploaded to the log entry page, so I wouldn't have known that captions were possible without reading this thread. The simplest solution might be to change the "Drop photos here, or select photos" label to "Drop photos here, or select photos. Click photos to add captions." It appears that the 'caption' option is not adding text to the photo's "Name". The text is going into the photo's "Notes". 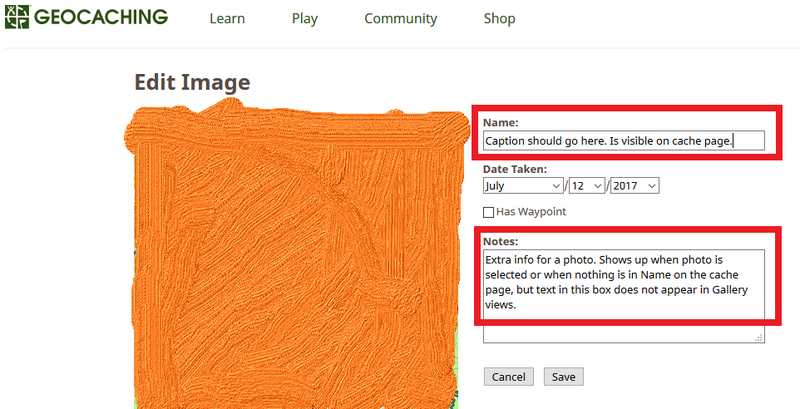 This means that the 'caption' added to the photo does not appear underneath the photo in the cache logger's Profile Gallery or the cache's Gallery. Can the new caption functionality add caption text to the photo's "Name"? Another odd thing I noticed is that if text has been added to a photo's "Name", then the "Name" cannot be made blank later. For example, if I add "abc" to the photo's "Name" and then edit the photo to delete "abc" - then that "abc" will still remain in the "Name". I can change "abc" to "abcdefg", but blanking out the "Name" is not possible. Additionally, selecting one of the "rotate" or "flip" options when editing a photo seems to have corrupted the photo. There is no thumbnail in the profile or cache Gallery and a "content can't be loaded" message appears when "View Image" is clicked in either Gallery. I can't recall if this has changed with the recent photo caption updates, but I'm not seeing a way to delete photos that have been mistakenly attached while composing a log. Did that exist before? I might be thinking of other websites that I've been using recently. In any case, it would be great to be able to delete photos while composing logs. For example, if I select the wrong photo file then I have to copy my log text, back out of the compose log window, re-select 'compose log', and paste my log text back into the text box. Then hope that I don't select the wrong photo file again. I'm still hoping that the log type (ie, Found It, DNF) becomes more prominent. I try to post DNF's and NM's right away, saving the Found It's for later when I have a bigger block of free time. The icons on the old Drafts page make it easy to scroll and spot the DNF's. It's tough for me to quickly spot which Drafts are DNF/NM in the new Drafts page. Please incorporate log type icons into the Drafts page. Maybe replace the pencil icon with the log type icon. The pencil doesn't seem relevant, since clicking anywhere in the draft entry has the same effect as clicking on the pencil. I don't know if the prompt is new, but I did notice the "Report a Problem" label change last month. I have to agree with dprovan about the new prompt not solving the issue of having the NM/NA reason included in the 'found id' log. I think it's good that there's a prompt to add a description of the 'reported problem', but it would seem more relevant to have that description text attached to the NM/NA log that gets created. I think it would be great if the prompt box was a text entry box, and the text entered into that box was appended to the NM/NA log. Someone clicks on "Report a problem" and a text entry box appears, with a slightly different prompt message and background color. Once someone starts typing in that box, the prompt message disappears, similar to the behavior in the app. The text entered into that text entry box gets appended to the NM or NA log that is created when the Found/DNF/Write Note log is submitted. The canned message could remain, in case a cacher doesn't add much detail. "This geocacher reported that the cache might be missing." becomes "This geocacher reported that the cache might be missing. | The tree has been cut down." I would think that having the details in the NM/NA logs would be of greater benefit to CO's and Reviewers and allow quicker resolution by making it easier to find the logs where the issue details are mentioned. CO's won't have to scroll though Found It logs to find the one that's from the same cacher that logged the NM/NA. CO's can flag the NM/NA email they receive and have the issue details more readily available for quick reference. -The caption now appears when reviewing logs on the cache details page if no “Name” exists. We will look into options on the gallery page, thanks for bringing that to our attention. -The photo editor is a little dated, you may have noticed it has been receiving some new attention since captions have been added - thanks for letting us know about this bug. -We were able to repro - this only applies to newly uploaded photos. It appears that rotating causes the file to break, but flipping appears OK. We’re working on getting this fixed now! -You normally don’t need to do this, but if you clear the cache you will see the “x” to delete the photo while composing the log. -Great! Glad that this is helpful. -We are looking at some options for this, thanks for the feedback. Thanks for the feedback, replies inline above! Oh man, I hope we don't get more inline responses to quotes because the quoting process is more obfuscated without the source view! code while composing the reply, even though it won't show formatted in the composition textbox, but it will show properly formatted with the preview button. noncentric: It appears that the 'caption' option is not adding text to the photo's "Name". The text is going into the photo's "Notes". This means that the 'caption' added to the photo does not appear underneath the photo in the cache logger's Profile Gallery or the cache's Gallery. Can the new caption functionality add caption text to the photo's "Name"? LivinginNarnia: -The caption now appears when reviewing logs on the cache details page if no “Name” exists. We will look into options on the gallery page, thanks for bringing that to our attention. Not sure we're on the same page about the caption and "name" vs "notes" section of the photos. The "Name" section of the Edit Image page (upper red box) is where the caption would generally go, and the text therein would appear on the cache details page and in the cache/profile galleries. The "Notes" section of the Edit Image page (lower red box) is where the new logging process is putting the caption text. The text in this section does not show up in cache/profile galleries, so someone has to click on the photo to see this text. This section does have a larger char limit, so it's sometimes used when the "Name" section isn't large enough. But most photos I've seen on geocaching.com do not make use of the 'Notes' section. Personally, I think it would be preferable that the new caption functionality feeds the text to the "Names" section of the photo, rather than the "Notes" section. Rather than trying to have the Gallery pages show the "Notes" content. Yes, one might be a little concerned when the designated development representative can't find a good way to do the common quote/response method. Oh man, I hope we don't get more inline responses to quotes because the quoting process is more obfuscated without the source view! -- There are ways to do responses inline without it being too difficult, like coloring and bolding the inline text. code while composing the reply, even though it won't show formatted in the composition textbox, but it will show properly formatted with the preview button. -- Yep, gotta love that preview button. (haven't figured out how to attribute the quote yet tho -- Yeah, the 'name =' doesn't seem to work. Quoting has become a bit of a challenge, see responses inline above. and get the quote to end before your reply, and then resume after your reply. Yes - I prefer that method and that is what I do by Opting Out of the new logging method, but I think it's pretty evident that entering separate logs isn't the direction that Groundspeak is going. If it's all going to be on one logging page, then I think it would be good to have that single page enable more detail in the NM/NA log entries. I'm just trying to propose a 'middle ground' solution. Selecting 'report a problem' already creates another text box on the logging page, although it's not a text entry box. The 'other' box says to add details to "your log". Not sure how adding details into the 'other' box would be any more cumbersome. The main goal would be to have the issue text go into the NM/NA log entry and thereby be included in the email that goes to the CO. If it's easier to program that the text is appended rather than replaced, then great. Maybe it's the same amount of effort, so then go ahead and remove the canned verbiage. I don't care a great deal about that. But if the logger doesn't add anything to the 'other' box, then the canned verbiage should be included. Thanks for clarifying - It sounds like you’re suggesting we change where we have added photo descriptions from the “Notes” section to the “Name” section. We decided descriptions will appear in the “Notes” section for a couple reasons including because as you noted there is a longer character limit here. With the addition of photo descriptions to the new logging page, a player would ideally only need to visit this old editing page for edits (!) when needed (nor would the old upload image page be needed to add photo info as was the case in the past, and which required players to choose from 1 of 2 text entries, or both). We have made updates to the cache details page so that the old “Notes” section (the new photo description section) will display if there is no “Name” so players can see any content associated with a photo on the C/D logs. And we will look into how content could appear in the galleries moving forward. It's pretty clear as I mentioned earlier that our old photo editing process is a little dated we're working on trying to make it a consistent and clear experience with the new additions we're making to the site! LivingInNarnia, thanks for clarifying. Now it makes sense. On the subject of a photo-handling rewrite, are there any plans to change the 640 pixel width limit for photos when displayed via the [geek-term:] lightbox on the cache page? Some years back it was 800, and I really missed that; many great shots suffer at the smaller size. Oh, and photos posted to the cache page directly by the CO haven't had lightbox-handling for years. I miss that too. I'm just trying to propose a 'middle ground' solution. Yeah, sorry. I've disagreed with you for all the wrong reasons a few times now. But this is why: I don't see your suggestion as "middle ground". I see it as encouraging them to continue even further in the wrong direction. You want to make this mistake work, but what happens is that once everything wrong with this mashup approach is fixed, the final solution will have all the same qualities that made them abandon the old approach. In other words, it won't be an improvement at all. And, in addition, it will be a confusing mashup. Being an optimist, I keep imagining if I point this out, someone will stop and think about it, which is why I argue against ideas that try to make bad ideas workable. Thanks for the extra info. It sounds like there will be just one text box for captions in the future? If so, then please confirm that the current "Name" content doesn't get lost when the new system is implemented. I have never entered anything into the Notes section. All of my 'captions' are in the Name section, as most photos seem to be, and it would be quite disappointing if those 'captions' get lost in whatever the new system ends up being. We have no plans to remove any existing content in the current "Name" section - for now, we'll be making minor tweaks based on feedback from the new photo description updates. Thanks for the feedback - it's not something we're looking into right now, but I will make sure that we explore this when we do! I have been thinking about the new way of reporting problems since the introduction but.... this is just not the right way to go. My friend is a geocaching newbie. She found GC5CKQ6 and she noted in her FI log that the cache had missing lid. I told her she was doing well and that she better use the "Needs Maintenance" log next time to indicate the troubles with the cache as many owners ignore FI logs. She replied "What is it?" "Aha, you're using the new logging experience. Use the Report a problem button then". She decided to do it right away so now there are three her logs on the cache page: FI, WN about the missing lid and NM containing "This geocacher reported that there is a problem with this cache.". If the owner filters out only the NM logs (for instance using some 3rd party app) how the "This geocacher reported that there is a problem with this cache." is going to help him? Why the NM log should not contain a detailed description of what is wrong? This is weird and not well thought out. I appreciate majority of improvements that have come recently but I'd really like to know the name of the person who came up with the idea that it would be better not to allow users to separately log the Needs Maintenance or Needs Archived logs.... The NM or NA log type always has the date of the day it was submitted on while the related FI or WN log might be dated several weeks or months back so in many cases they even won't display next to each other. I also like the new possibility to add notes to the photos directly when logging a cache. But of no Name is added to a photo the Note should be visible below a photo in the caches and the cachers gallary section. Today you can see only Names at that place. If the Note is added while logging the Gallery-Subline is empty. I still see a little problem in the fact that the new notification text for need maintenance (like "This geocacher reported that the cache might be missing." is posted in the set account-language of the cacher who had reported the problem. When I set my account to german and log a need maintenance for a geocache while a journey in france the cache-owner might not understand the german notification. It should be posted in the cache-owners or caches-location language (or translated automatic with the rest of the website but that sounds difficult). I was wondering where the "needs maintenance" button went. This should be added to the "learn" tab. the new standard texts when pressing the "report a problem" button are written in the language my profile is set to - which may have nothing to do with the cache owner's language - bah! the new way of "reporting a problem" may be an additional way to go for those new to the game or for those who do not want to give additional information - but for the rest of us the old way was much better. Three things regarding the new "Report a Problem"
1. Will this feature be available in the mobile app? At this time, I cannot figure out how to report a problem via the app. 2. Could the option for "Logbook is full" be broadened? I live in Florida where not only can logbooks be full, but they are often waterlogged and unsignable. This is a very common problem and needs to be an option for us. 3. I know the timestamp of logs was a major thing that was fixed in this update. However, the Report a Problem logs are all being timestamped from the time I finish a found log, not the time I started it from a draft. Thus, they are not paired up with their corresponding found log on my personal page listing. This is confusing and cluttered. Certain log types have always been dated with the time the log was submitted, and the user isn't able to change that. Needs Maintenance is one of those log types. What makes it particularly confusing now is that the Needs Maintenance log is merely a placeholder, with a pointer to the original log, which may not appear next to the Needs Maintenance log depending on the dates of the two logs and how much traffic the particular cache has had. If you're using the official app, then you will see a "Report a problem" option by clicking the "..." (vertical or horizontal depending on OS) after you have selected a specific cache. Once you click on "Report a problem", then you'll be given the option of choosing either Needs Maintenance or Needs Archived. Select which one you want and then you'll get a text box to describe the problem. I like that the app provides the 'old way' of reporting NM/NA, without the canned responses. For example, if the logbook is wet, then you could use the app and describe the issue, rather than being forced to use the "Other" canned response. I really do not like how the new Report a Problem option works. It posts two logs, not one. One with a generic "This user has reported a problem" and then a second note that has the actual description of what was wrong. And then there's a third log of your Found or DNF.